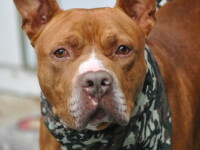 Midwest Rescue of Illinois | Finding forever homes for Chicago's pit bulls! 8th Annual Barking for Brews! It’s that remarkable time of year again when we all gather at the iconic Revolution Brewing in the lovely city of Chicago for our Barking for Brews Annual Beer-tasting Benefit! April 7th from 4pm – 6pm you will enjoy unlimited servings of Revolutions five core microbrews, tasty appetizers and rockin’ fellowship with rescue-minded folks like you! We will also have a 50/50 raffle, fun raffle prizes and inspired auction items that you won’t want to miss out on. Join the Pit Bull Revolution at Revolution Brewing, we have the entire 2nd floor. There’s lots of room so be sure to bring your family and friends! Tickets are just $45, you can purchase online or at the door. From tee shirts to hoodies, from baby outfits to doggie clothes, from computer skins to phone covers, we have what you want! Check out our store on Cafe Press and we promise you won’t leave without buying something fun for yourself, your furkid or your favorite person! Midwest Rescue of Illinois, Inc is a small group of caring individuals who are determined to make a positive impact in the lives of pit bulls. We are a volunteer run and foster based rescue. Volunteer run? Yes, we are all volunteers of Midwest Rescue. The board members and volunteers are not paid; each individual that supports Midwest Rescue also has a full-time job. We do this in our free time because we care. Want to volunteer? GREAT! Attend an adoption day and other local events. Organize a fundraiser. Help with the daily operating activities. Let us put your skills and talents to work. Foster based? This means Midwest Rescue does not have a shelter or facility. We rely solely on caring individuals to open their homes, providing a loving, structured home life for our dogs. Midwest pays for the food, crate and vetting for a dog within our rescue. Fosters provide a healthy, caring home environment, in addition to playing a key role in helping a dog find the perfect home. This limits how many dogs we can have in rescue at any one time. We can’t accept more dogs than we have homes and funds for. Adopt? We are looking for loving families and owners to give our dogs the great homes they deserve. We work closely with people to make sure the dog they want to adopt is the right “fit” for them. Give! We run completely on your donations. Midwest Rescue of Illinois, Inc does not receive funding from the State or Federal government. The monies that people like you donate provide Midwest with the power to save more lives. Become part of Chicago’s pit bull rescue community: join us on Facebook!